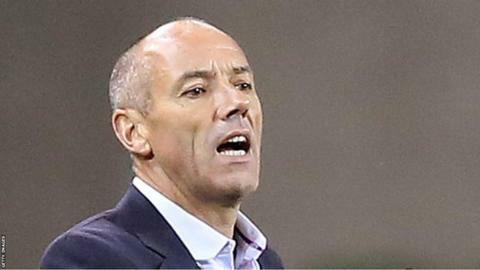 The Nigeria Football Federation has named Frenchman Paul Le Guen as the new Super Eagles technical adviser. Le Guen, 52, lead Cameroon to the 2010 World Cup finals while Yusuf the Super Eagles to friendly wins against Mali and Luxembourg in May. The appointments are subject to agreement of contract terms with the NFF Executive Committee. The duo were named on a short list along with Belgian Tom Sainfiet earlier this month. Coach Imama Amapakabo and goalkeeping trainer Alloy Agu will also work with Le Guen and Yusuf. Nigeria have failed to qualify for the 2017 Africa Cup of Nations finals in Gabon but are in the final round of qualifying for the 2018 World Cup. Sunday Oliseh was the last permanent coach of Nigeria before he quit in February in a row over his contract. They have been drawn in Group B where they will face, the top-ranked side in Africa Algeria, Le Guen's former charges Cameroon as well as Zambia in the race to reach Russia. The NFF's technical committee also recommended that former Super Eagles assistant coach Bitrus Bewarang be given the role of National Technical Director.